The club are delighted to announce that we have signed Josh Todd on a permanent deal following a successful half season loan spell which has brought 19 appearances and nine goals for the club since his loan spell commenced at Galabank in Sept 2013. Josh has penned a deal to May 2015. 19 year-old Josh, a Scot, 19, came through Carlisle Utd’s youth programme and signed a pro-contract for the Borderers at the strt of season 2012/13 season. A little known fact is Josh was with Annan Youths at the age of 12 before he joined CUFC’s programme. 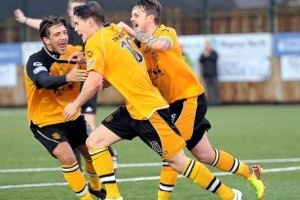 We are also delighted to announce that the player is being sponsored by the Official Annan Athletic Supporters Club.